This page is currently underconstruction.... it is part of my efforts to join the #WOL movement (working out loud)... sharing is a fundamental principle of my personal & professional philosophy as a life-long and lover of learning... #WOL to me represents to me an intentional practice of being transparent and fostering collaboration throughout the project cycle-- not just during the research or public phase. There is a lot of variety in the titles and responsibilities in among the staff and administrators in my field. Some colleges and universities have instructional technologists, academic technologists or learning technologists. At some institutions they have Instructional Designers or Teaching and Learning Experts. Another difference you'll find among colleagues in my field is whether they are part of their institution's IT department or President/Provost's office. At Fordham, my office is part of the Instructional Technology Academic Computing branch of IT and similar to many teachers today we wear different hats! Read more about my career path and what I do as a Senior Instructional Technologist on my About page. Someone once asked me, how am I able to accomplish everything I do? My answer: my superpower and being really organized! I'm able to read really, really fast and that gives me a huge edge when it comes to finding, evaluating, filtering, organizing, sharing, and applying information. I'm working on ways to refine my personal strategies and articulate my knowledge intake/sharing routines. Reflect on the one major goal I want to achieve for the day. I use Google Keep to keep track of all of my lists and refer to them throughout the day, but it's really helpful to start the day off by thinking of the one major thing I want to accomplish by the end of the day. I like Google Keep because I can switch between my work/personal accounts easily and have access on any device. I also like how I can change the color of the notes and use check boxes. There's only so many features which makes it easy to focus on what you need to do and not spending a lot of time on formatting. ​I sort my work account according to the 5 categories of projects to keep track of what I'm working on and things I need to remember. I also include notes for specific people like my boss, student workers, and colleagues that I usually interact with so I can keep track of things I don't want to forget to ask them when I see or speak with them. I'm lost without my calendar! I have to put all of my meetings, events, birthdays, and even when I get paid on my calendar or I will lose track of what's going on. I check my calendar in the morning to get a snapshot of what my day looks like. I also keep that tab open all day and have the Gmail plugin enabled to have the calendar agenda displayed on the left side of my inbox. And even then, I find that I will write post-its for myself if it's a super busy day or there's something I'm worried about missing. I'll refer to my calendar throughout the day to make sure I'm on track and I'll also make sure to spend time in the afternoon or before I leave for the day so I can get a head start on what I need to set up for the next day or the week. I think I've finally found the winning strategy to manage my inboxes without losing my mind! I've gotten rid of ALL of the emails clogging up my tabs by setting up filters. I am committing to leaving each day with an email count of zero. All issues that I will be working on before responding are going to be added to my Google Keep notes as a pinned note at the top or to one of my previously defined categories. **Me- to do- these are emails that I'll send to myself or forward from one of my other email accounts with info that I need, want to add to one of the wikis that I manage, or share out in another fashion. These get tackled as time allows. 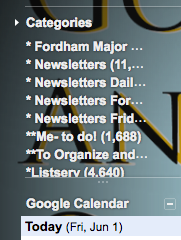 **To Organize- I had whittled my inboxes down to about 100 emails that I need to go through and sort. Most will either get organized into my Google Docs, added to my notes, or filed. I'm going to tackle a little bit at a time each week and try to have that taken care of over the summer. I have 4 other corporate accounts I manage at work or have access to, but all of those won't need as much work because I'm not the only person using them. I just need to work on sorting the 10 other personal accounts I have... One day at a time! At the end of the day I like to take a little time to write up the highlights of what I worked on during the day, this helps to keep me accountable and my projects on track. I frequently look over my goals for the week and reflect on the state of the projects I'm working on. And just like I took time at the beginning of my day to think about what the most important thing to accomplish for the day is, I like to end the day with thinking about whether or not I did and why/how. Reflection is the fundamental key to the Ignatian Pedagogy Paradigm. I've learned a lot about Ignatian Pedagogy working at a Jesuit university, but I also recommend this method to teachers at any institution. The more we can incorporate reflection into our daily lives the better we and our students are for it. "The Knowledge Project Podcast explores ideas, methods, and mental models, that will help you expand your mind, live deliberately, and master the best of what other people have already figured out." Koenig, Michael E. D. “What Is KM? Knowledge Management Explained.” Globalization-Business Opportunity and KM Challenge - KMWorld Magazine, KM World, 15 Jan. 2018. 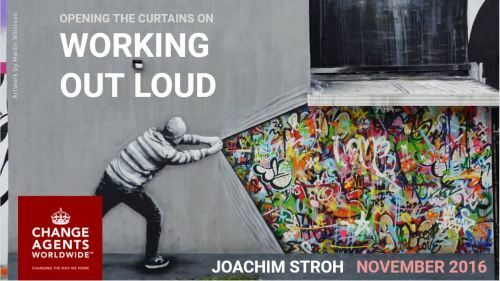 Joachim's presentation was fantastic and I highly recommend taking a look. Besides a great presentation, I also really enjoyed the group discussion. So I decided to dive in and join the group by volunteering to give the presentation and start the conversation at the next meeting by sharing specific examples of my work in the Instructional Technology Academic Computing department of IT. Specifically, how these projects have crossed organizational boundaries to help foster connections between different departments and groups at Fordham. At the next session I attended we discussed the topic of Fake News and the following one after that was on the topic of Smart Cities. Both sessions had a fantastic group of attendees and conversation. I also really enjoyed the session I attended around the theme of Health Care where we wrote and performed a play together. If you're in the NYC area and want to join us, sign up on the Meet.Up page and don't forget to follow the group's Twitter account!